They should add “Everything” to the “What is the main reason for your rating” This is the best theme out there and it’s really cheap! Looks simple but it has a lot of in depth and good features! This theme is the definition of awesomeness. This is such an awesome and versatile theme! Out of the box it looks so professional and well thought out. Best PHPBB3 theme we’ve used. It is also highly customizable, and you can easily customize it to your needs. Support is TOP notch. Any issues or even general questions have been resolved via their forum in a matter of minutes. Also lots of MODS available and some of the premium ones are really worth it. The rating drop-down box only allows you to select one reason for rating 5 stars. In reality it is all of them. This is a fantastic theme built by someone who knows what they are doing. Dave is A+ developer. If you are looking for a forum template, you won’t find better than his in themeforest. His is the best! I’m using FLatBoots template and I love it. I ordered customization and all set ups from him, and he is the best in what he does. Dramabuzz.com Website was up and ready under 4 hours. Since I’m a complete newbie in website development, I keep bugging him with questions everyday Sorry Dave :)) And he always answers my questions and explains everything. The support is A+ for this template! First and foremost, this simple yet modern and clean design is what sold me, but the reason behind the five stars is it’s designer – Dave. For a few months now, we have been working back and forth in order to customize and finalize our website. Dave has been such a godsend and amazing part of that whole process. Great open communication, great after-service, so patient and understanding, and just an awesome guy in general. I’d recommend this theme as well as any SiteSplat products, hands down! Everything – design quality, feature availability, flexibility, customer support, bug-support, customizability, code quality, documentation quality…. and friendly communication. I have not tasted everthing what stands above, but when you take a step inside the supportforum you’ll see that everything is true. Thx Dave for a piece of code that makes so much fun! Awesome phpBB Design with very easy usuability, but on top of it , it was Customer support which made me most happy, i have used many themes before, but never really got satisfied with customer support Sitesplat is real surprise as it got outstanding support too, sadly i can only give max of 5 stars ! Highly Recommended for your Forums ! To all future buyers, I come around since I got myself Flatboots and want to give a boost to Dave’ sales for the following reasons. - Access to a great community with plenty of MODS available for FLATBOOTS - Premium Mods that will rock your forums - Super fast and friendly support (I believe Dave is an alien, he doesn’t sleep) - yet my forum is not fully launched, I receive a loads of positive feedbacks about it and from forum owners too. Those $16 will be the best purchase you will ever made for a forum style. This is not just a skin, it’s a perfectly polished product with a great support forum and additional modules. Feels even a bit like a new engine. 5 stars from me! Its the perfect theme to start customising your forums! The addons, the way the theme is built, the support, the mod support ( they have made styles for the most popular mods to match the theme, how cool is this?! ), the topic loader widget, everything about it, Couldn’t be easier to work with! Absolutely love it! Absolutely perfect. No competition both in&out of themeforest. This stamps on all other designs I hav seen. ONE SIMPLE STATEMENT. Buy it or you’ll regret not doing so. Support for this item is absolutely amazing. Extremely easy to set up the style, and if you have any issues it’s incredibly easy to get assistance. The theme is also exactly what I was looking for. Original. There are not many other themes like this out there, and it really grabbed my attention. Everyone who I’ve shown the forum to so far also loves it. The quality and customization availability is fantastic. MOD’s for the style are also regularly updated and released, which makes everything even better. Keep up the great work. Much appreciated. Amazing phpBB3 theme with excellent support from the authors. Highly recommended and thank you for your work! Was not sure about the purchasing this theme and having it customized but Dave was great to work with. He met my expectations in both the final theme and timeframe to complete the theme. I highly recommend Dave and his work. ALL REASON IT’S VALID!! BEST THEME, BEST SUPPORT, BEST CODE QUALITY, BEST GUIDE, ALL THE BEST!! I’M VERY HAPPY! THANKS!! INCREDIBLE. I’ve received nothing but compliments since installing it. Easy to use, beautiful highly customizable and the support from Dave is fantastic. Best purchase I’ve ever made here. Register or Login to the members area ONLY for access to Premium Addons, tutorials, the support forums, see the latest changes to FLATBOOTS, Latest news and much much more! Yes an whole ecosystem built around SiteSplat’s products and clients only. How cool is that?!! 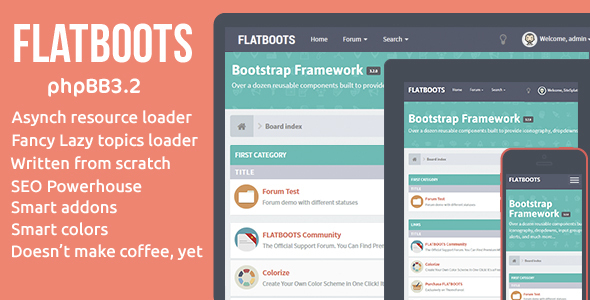 Latest and always Updated Change Log Available Here: FLATBOOTS Changelog Includes Upgrade instructions, manual changes for theme Tweakers lovers and much more.